This taco bowl was another recipe I developed while working on an autoimmune meal plan (for more information about AIP, check out my last post here). Just because someone is following a strict dietary protocol, doesn't mean they should have to sacrifice flavor or fun cuisines! Coming up with a taco spice blend without any peppers or seeds (that eliminates all the usual suspects - cumin, chili powder, red pepper flakes, paprika, etc.) was no easy task but even my unknowing boyfriend (who is a taco fanatic) was pleased with the final result. Make the ground beef: Melt coconut oil in a large pan over medium heat. Add minced garlic and sauté to release flavors. Add the ground beef and brown, stirring frequently and breaking the meat up with a wooden spoon, until the the meat is almost no longer pink (about 4-5 minutes). Stir the taco seasonings into the meat and add apple cider vinegar and reduce the heat to low. Cook until the meat is done (about 5 minutes). Make the cauliflower rice: In another pan, melt coconut oil over medium heat. When hot, add the frozen cauliflower rice and break up with a wooden spoon. Sauté for a couple minutes and add the bag of shredded cabbage, lime juice and sea salt. Cook until softened. Remove from heat and add the cilantro and stir to combine. 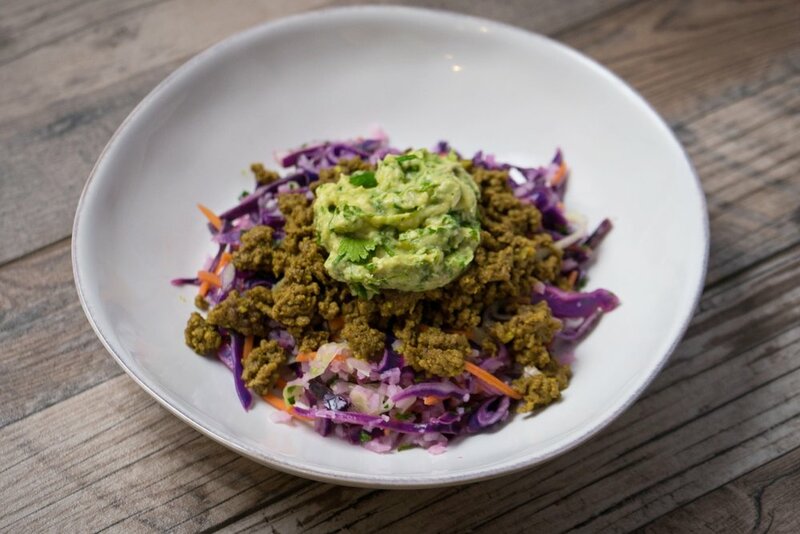 Make the easy guacamole: While the beef and cauliflower rice cook, mash 2 avocados in a bowl with the rest of the ingredients. Assemble: To serve, spoon the cauliflower rice into bowls and top with ground beef and guacamole.